Mattress film is the only thing preventing your saleable finished goods from becoming damaged written-off products. It's quality is not something that should be left up to chance. Layfield mattress film is made from our proprietary LayFlex® co-extruded film developed to provide superior strength over mono-layer mattress film. This film allows you to reduce your film usage while maintaining or even improving packaging performance. In addition, it has a +/- 3% gauge tolerance (vs an industry average of +/- 10%) to offer a high level of consistency in processing and sealing. 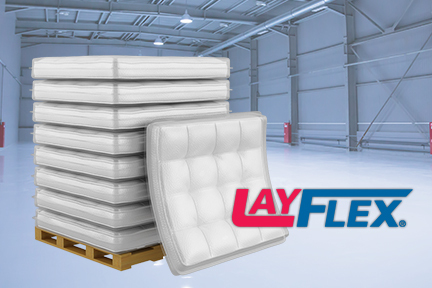 LayFlex® mattress film will provide you with the peace-of-mind you want, knowing that your product is going to arrive on your customer's doorstep in the same condition as when it left your production facility. This proven reliability is why more and more manufacturers are moving to a Layflex® solution.